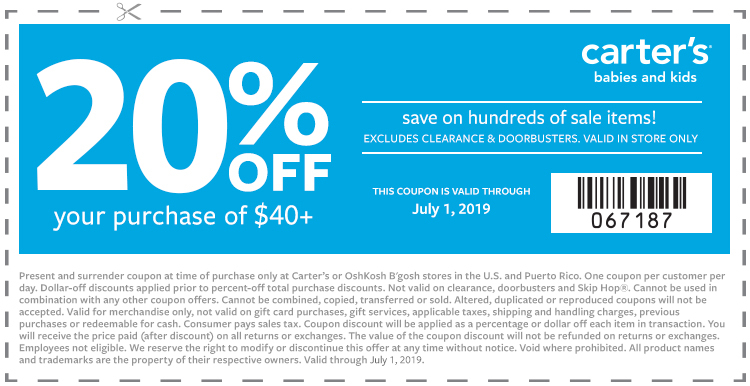 Disclaimer: Present and surrender coupon at time of purchase only at Carter’s stores in the U.S. and Puerto Rico. One coupon per customer per day. Dollar-off discounts applied prior to percent-off total purchase discounts. 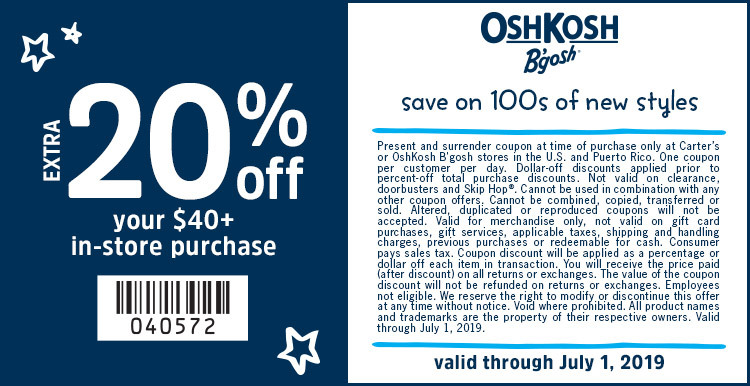 Coupon not valid on clearance, doorbusters, Skip Hop®, non-Carter’s and non-OshKosh branded footwear. Coupon cannot be used in combination with any other coupon offers. Cannot be combined, copied, transferred, or sold. Altered, duplicated, or reproduced coupons will not be accepted. Valid for merchandise only, not valid on gift card purchases, gift services, applicable taxes, shipping and handling charges.Valid through July 1, 2019.